Had the pleasure of working with Dave Hooper once more this week. This time on a Single Pitch Award training course. Despite the sweltering heat, broken at times with summer rain showers, the candidates received a full and complete course. Saturday was spent at Clowgyn Cyrrau that sits above Betws y Coed. 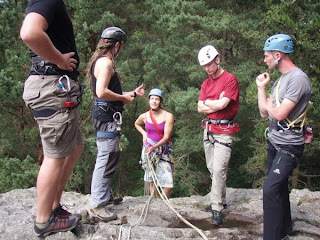 The day was used to explore personal climbing skills including belays, lowers, personal abseils and environmental impact factors. The evening session was held at Plas y Brenin's climbing wall and looked at the specifics of running activities as such a venue. Sunday brought with it more warm weather and a change of venue. 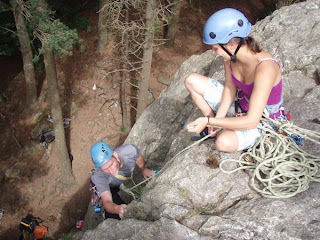 Due to the ever popular nature of Lion Rock, we worked on Spotted Crag for the day. 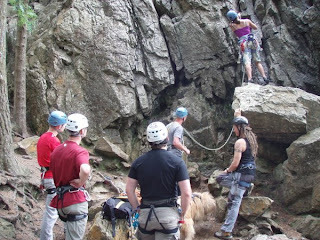 Here we covered all the necessary areas for supervising a group at the rock face including management, group belay systems, abseils and problem solving. After which we retreated to the Caban in Brynrefail for cold ginger beer and the course review.